This baseball scorebook from the early 1950s was used by Fred Simpson, the Berryton High School baseball coach. Games scored in the book cover the years 1951-53, including the state tournament games in 1951 when Berryton won the state Class B high school baseball championship. Berryton defeated Gridley, 7-3, in the title game played in Peabody on May 12, 1951. 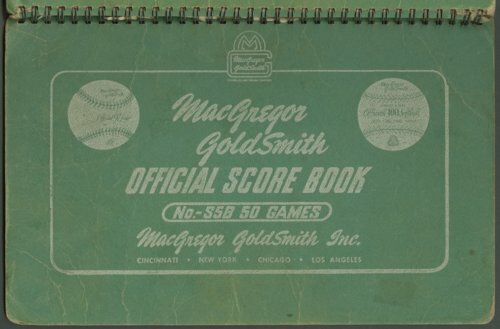 Digital reproduction of the scorebook was accomplished through a joint project sponsored by the Kansas Historical Society and the Shawnee County Baseball Hall of Fame.